Woodlands and adjacent open areas, parks, suburban areas, trails, roadsides. This is a medium-sized angle-wing butterfly. It has a wingspan of 2¼″ to 3″. The first generation each year (winter form) is noticeably darker than the second generation (summer form). The wings are noticeably angled rather than rounded. The outer margins are jagged and fringed. The fringe is white on the winter form, violet on the summer form. The violet fringe on the summer form is especially noticeable on the hindwing of young (fresh) adults. The fringe fades to white with age. The tip (apex) of the forewing is strongly curved backward (hooked). The hindwing is tailed. The tail of the winter form is long, that of the summer form is short. The trailing edge of the hindwing is more or less straight. 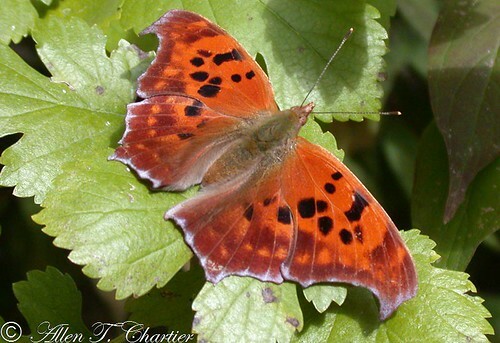 The upper side of the forewing is reddish-orange with a broad dark margin band. The marginal band of the winter form is orangish-brown, while that of the summer form may be orangish-brown or black. There is a large black spot on the cell-end bar and 6 smaller black spots in the subapical area. 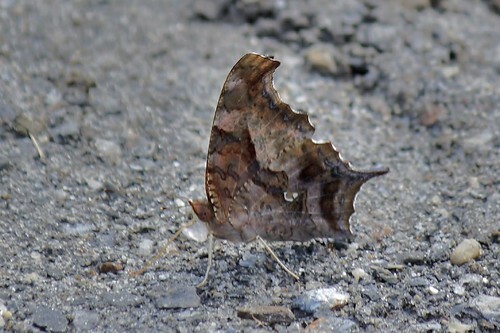 The largest of these 6 spots, the one closest to the trailing edge of the wing, often has a pale black spot immediately above it. One of the spots, the “extra” spot, is a horizontal bar directly outside of (posterior to) the cell-end bar. The upper side of the hindwing of the winter form is mostly orangish-brown, while that of the summer form is mostly black. There is a submarginal row of reddish-orange spots, and three medial and one postmedial black or orangish-brown spots. One of the medial spots is on the leading edge if the wing and is usually not visible on perched specimens. The postmedial spot is not visible in the black area of the summer form. The underside of both wings is orangish-brown on the winter form, light brown on the summer form. They may be mostly uniform in color or heavily mottled. In the center of the hindwing there is a curved silvery line and dot (often described as a broken curved line) that forms a ?-shaped mark. The caterpillar is variable in color and up to 1¾″ long. Though fierce looking, they are harmless to the touch. The head is reddish-brown with 2 short, dark, spiny projections (scoli) and numerous shorter white spines. The thorax and abdomen is usually red and orange, sometimes black, with numerous, highly-detailed white spots. On some individuals the body is mostly white, sometimes appearing yellowish. There is a cream-colored to rust-colored stripe in the middle of the upper (middorsal) region extending the length of the abdomen. The line is jagged and is often broken. There is a similar line in the subdorsal, supraspiracular, spiracular, and subspiracular regions. The lines connect long, thick, stiff, branched scoli on each abdominal segment. The scoli vary in color. They are orange, red, or yellow, at least at the base, and often black above the base. The central shaft of the middorsal and subdorsal scoli are usually orange. The base of the leg-like structure (proleg) on each side of the middle abdominal segments is wine red. Mature caterpillars are found in late early summer (summer form) and late summer (winter form). 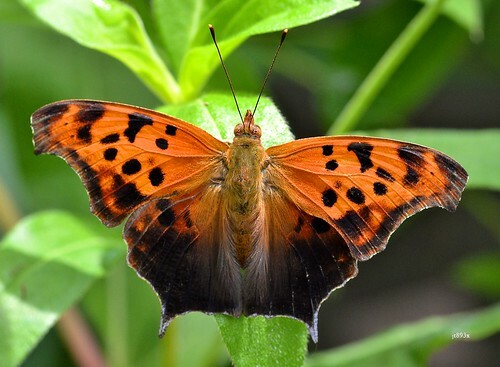 Eastern comma (Polygonia comma) is usually smaller. The forewing apex is less hooked. The trailing edge of the hindwing is more ragged. The hindwing tail is shorter. The marginal fringe is always white, never violet. There is no extra spot on the upper side of the forewing. The curved line on the underside of the hindwing is unbroken (there is no dot). American elm (Ulmus americana), slippery elm (Ulmus rubra), northern hackberry (Celtis occidentalis), common hop (Humulus lupulus), Japanese hop (Humulus japonicus), stinging nettle (Urtica dioica ssp. gracilis), and small-spike false nettle (Boehmeria cylindrica). Adults prefer to feed on rotting fruit, tree sap, dung, and carrion. Only when these are unavailable will they feed on nectar of flowers such as common milkweed (Asclepias syriaca) and aster (Symphyotrichum). The females lay eggs singly or stacked in chains or 8 or more on the underside of leaves that are not host species. Winter form females lay eggs in early spring to the end of May. When the eggs hatch the larvae must search for a host plant. They molt four times before pupating. Winter form adults may migrate short distances but overwinter in cold areas by hibernating in a bark crevice, the siding of a house, or other sheltered place. On warm winter days they may be seen flying. Caterpillars feed on the underside of leaves of host plants. A fleshy structure on the abdomen of some insect larvae that functions as a leg, but lacks the five segments of a true insect leg. A spiny, branched projection from a larval body wall, the branches terminating with a single stiff, hair-like or bristle-like tip. Photographed at Grand Forks, North Dakota (25 May 2012). Photographed at the Turtle River State Park, North Dakota (23 April 2010). Shot in July, 2009 in a fence row on McBee Island in the Holston River in Jefferson Co , TN, this vibrating chrysalis successfully emerged two days later into a Question Mark butterfly (Polygonia interrogationis). Buzzing like a rattlesnake, moving and flashing so quickly that it was difficult to tell what it was, there is a suspicion this chrysalis sensed danger from parasitiod tachinid flies and began its rapid vibration as a survival tactic. Video recorded by Lynn Faust of Emory River Land Co, a firefly researcher and naturalist in Knoxville, TN.